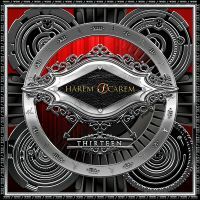 Canadian band HAREM SCAREM was formed out of the ashes of BLIND VENGEANCE and MINOTAUR by guitarist Pete Lesperance and vocalist Harry Hess, the other members being bassist Mike Gionet and drummer Darren Smith (these days vocalist in Jake E Lee´s Red Dragon Cartel). As anyone will figure the band has now reached their thirteenth studio album, not counting the first demo and the re-visitation of “Mood Swings” in 2013. As often there has been a few people coming and going, but today´s version of the band still has Harry and Pete at the helm, backed by bassist Stan Miczek and apparently Darren on drums. This album was, as many, a result of a pledge music campaign. Opener “Garden of Eden” is a fine opener, and probably the one I would have chosen myself. The riff displays some agile guitar work, the arrangement is great and the refrain is both mature and lingering. They show signs of THUNDER is “Live It”, which is more Rock´n´Roll, as well as blues in e.g. “Stardust”. There are a few average tracks, like “Early Warning Sign” and probably the guitar dominated “Saints & Sinners”. But songs like “Stardust”, with great guitar work, the refrain of “Never Say Never” and, especially, the bluesy and presumed live favourite “Troubled Times” must cement their reputation of a really good act in their genre. You should check this out, it is sports a fine mix of hard rock, MOR and bluesy grit.